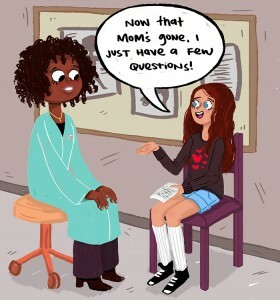 Home » Moving up » At the doctor’s office/clinic » Being confident: What does it mean? Confidence does not equal knowing everything and not asking questions. Confidence is asking the questions you want to ask and taking steps to understand your body. Confidence means sharing what’s on your mind. Confidence means asking for time alone with a doctor if this feels more comfortable. Confidence means saying no if something doesn’t feel right or you don’t feel ready. It takes time for things to sink in; most doctors get that. Even if you don’t have questions right now, it’s okay. Just as long as you know how you can get answers to questions when you do have them. And when you think of a question, be sure to jot it down in the ‘Notes’ section of your phone or on a notepad so you can share it later with your doctor.